Snaps, no. 51: Sidney Locus. On 20 January 1909, Sidney Lucas, 21, of Taylors, son of John and Delphia Lucas, married Mamie Rountree, 17, of Taylors, daughter of Alex and Watie Rountree, at Emma Rountree’s in Taylors. Missionary Baptist minister William Rodgers performed the ceremony in the presence of James Ross, Pollie Howard, and Emma Lucas. In the 1910 census of Jackson township, Nash County: farmer Sidney Locus, 22; wife Mammie, 42; and son Lafayette, 7 months. Sidney Locus registered for the World War I draft in Wilson County in 1918. Per his registration card, he was born 30 September 1887 in Wilson; was a farmer; and had a wife and dependent children. In the 1930 census of Taylor township, Wilson County: farmer Sid Lucus, 52; wife Mamie, 42; and children Fate, 21, John, 18, Eva, 18, Ivey, 14, Guy, 10, Sidney, 8, Marth, 7, and Martha Ann, 0. In the 1940 census of Taylor township, Wilson County: farmer Sidney Locus, 52; wife Mammie, 42; and children Fredy, 25, Sidney Jr., 19, Mary, 17, Martha Ann, 15, Mamie, 12, Maggieleen, 10, and Sussie Gray, 4. Photo courtesy of Ancestry.com user samjoyatk. Snaps, nos. 41: J. Frank and Annie Bell Green Barnes. 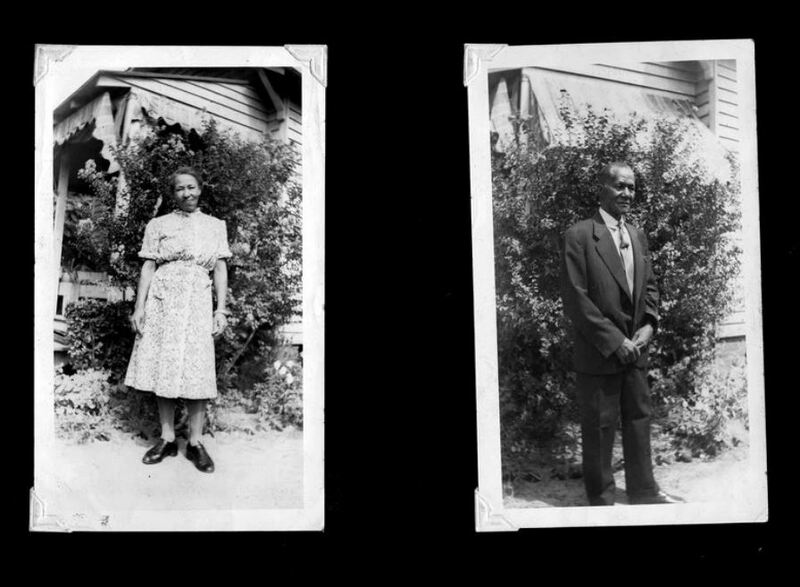 Among the pictures found in Emma Barnes Taylor‘s discarded photo album were these depicting her parents, Annie Bell Green Barnes and James Frank Barnes, possibly standing beside their home at 106 South Carroll Street in Wilson. In the 1880 census of Toisnot township, Wilson County: farmer George Barnes, 29; wife Silvester A., 24; and children John E., 5, Jacob H., 4, and James F., 1. In the 1900 census of Wilson, Wilson County: carpenter Neverson Green, 45; wife Isabeler, 35; and children Mary J., 18, Annie B., 15, Oscar, 13, Ada, 11, Ora, 9, Rose L., 6, William O., 5, Lula B., 2, and Besse, 3 months; plus boarder Willie Alley, 21, farm laborer. On 27 April 1904, Frank Barnes, 25, son of George and Sylvester Ann Barnes, married Anna Green, 20, daughter of Nelson Green, in Wilson. Fred M. Davis, Missionary Baptist minister, performed the ceremony in the presence of Peter Bynum, Boston Griffin and Dorsey Powell. In the 1910 census of Wilson, Wilson County: on Saratoga Road, store deliveryman Frank Barnes, 26; wife Annie, 26; and sons Charlie, 5, and Frank, 3. In 1918, James F. Barnes registered for the World War I draft in Wilson. Per his registration card, he was born 12 January 1878; resided at 106 Fifth [later renamed Carroll] Street; was a laborer for Barnes Harrell Grocery Co., 112 Goldsboro Street; and his nearest relative was Annie B. Barnes. In the 1930 census of Wilson, Wilson County: at 106 Carroll, owned and valued at $800, wholesale grocery supply clerk Frank Barnes, 50; wife Annie, 44; children Frank Jr., 22, a pool room janitor, Etta M., 11, James H., 6, and Jeraline, 4; son-in-law Jack Artist, 21, odd jobs laborer, and daughter Mildred, 17, tobacco factory hander. Wilson Daily Times, 10 June 1930. Like many in the early days of the Depression, the Barneses faced foreclosure in 1930. It appears that they lost the house, but continued to live in it as renters as reported in the 1940 census. In the 1940 census of Wilson, Wilson County: at 106 South Carroll Street, rented at $20/month, Annie Barnes, 57; husband Frank Barnes, 62, wholesale grocery shipping clerk; children Frank Jr., 33, Hotel Cherry attendant; Etta, 21; James, 16; and Geraldine, 15; James Artis, 29, laborer, wife Mildred, 29, tobacco factory hanger, and their son Charlie, 10; and lodgers Lara Jones, 22, housekeeper, and Lula Green, 42. James Frank Barnes died 9 October 1951 at Mercy Hospital. Per his death certificate, he was born 12 January 1878 in Wilson County to George Barnes and Sylvester (last name unknown); lived at 106 South Carroll; and was a laborer. Annie B. Barnes was informant. Annie Bell Barnes died 31 January 1974 in Wilson. Per her death certificate, she was born 12 March 1880 in Virginia to Nelson Green and Isabella Thorp; was a widow; and resided at 1702 Queen Street. Informant was son James Herman Green.